August and September 2006 saw a highly controversial series of sweeping changes in the definition of our solar system,resulting in the much lamented ‘demoting’ of the former planet Pluto to ‘dwarf planet’ status. Before exploring the meaning of these decisions, let’s review what actually happened. In the world of scientific astronomy, the International Astronomical Union is the committee responsible for naming and classifying newly discovered celestial objects. It is composed of eminent astronomers from many countries who meet periodically in different places, with the huge task of 'ordering' the multitude of new objects being discovered daily, thanks to recent advances in technology. The recent meeting in Prague was a particularly controversial one. The re-classification of Pluto, however, is not a new theme. 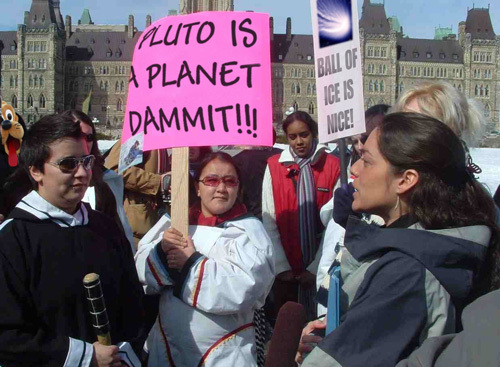 It has an interesting history: already in the late 1990s, the move to ‘demote’ Pluto was afoot, but hotly contested, and eventually quashed around the Millennium. In 1977, the anomalous object Chiron was discovered. In the Greek mythology Chiron was a wise Centaur who represents the shamanic figure of the Wounded Healer. So unlike anything in the solar system was this new object that it was re-classified several times, and indeed still retains ‘membership’ of the categories of asteroid and comet. However, once the Kuiper Belt was discovered, a whole ‘herd’ of celestial Centaurs began to appear and were gradually named, after Centaurs in the mythology. So Chiron found his ‘tribe’! Astronomically, these objects share their key features with Chiron: all have very elliptical orbits, steeply inclined to the ecliptic, and they mostly cross over the orbits of one or more planets from Saturn outwards to Neptune. The Centaurs tend inwards to the Sun, then move outwards again to the Plutonic realm in the further reaches of the solar system from whence they are said to have originated. The Sun symbolises the Light Within, the central integrative factor around which all else revolves. Pluto’s realm is the Underworld, the faraway place of fertile darkness, which represents the place where the shades of the departed go, for a time of purification and preparation for re-birth. It is also metaphorically ‘underground’, where the seeds of new life germinate, where the unborn nestle in safety until called forth by their need to emerge. The Centaurs are said to be the archaic remnants of our origins, the pristine remains of the log-past beginnings of our own Solar System. They symbolise the archaic fragments within ourselves, the 'primal human' archetypal within which we will meet on our journey to our own centre. This is a reflection of our own developmental process, as well as the theme of our human continuity through the on-going chain of ancestral connections. This is the 'stuff' of our incarnation, which may either support or sabotage our sense of purpose. From the Centaur point of view, bearing witness to these inchoate beginnings is an important aspect of the process of individuation. In ignoring our 'animal selves' we become unable to be custodians of the natural world, our home. This is the condition in which we find ourselves today. Pluto actually shares all characteristics with the Centaurs, including the fact that it actually crosses the orbit of its inner neighbour, Neptune! Poignantly, Pluto last emerged from the waters of Neptune in 1999, when the first move to 'demote' him was roundly defeated. So we can consider Pluto as the ‘Lord of the Centaurs’, who are in turn his emissaries, agents or perhaps escapees. The symbolic connection between Pluto and the Centaurs is apparent when one observes their psycho-spiritual processes at work – the symbolism is perfect! In the mythology Pluto was the Lord of the Underworld, and in the sky Pluto is the King of the Kuiper Belt. As above, so below. They represent those initiatory experiences that are truly of ‘another order’ beyond the personal ego. Lo and behold, the astronomers have actually expressed this symbolism! The Greek word ‘metalogue’ means ‘that which we are speaking about is also arising', denoting the co-arising of event and language. The timing of the IAU re-classifications was truly breathtaking. The period before the first flurry of revisions (later undone and changed) saw the uncovering of an alleged international terrorist plot to blow up several aeroplanes. In political terms ‘The Underworld’ comprises ‘The Enemy’ and its unseen activity – currently Terrorism, as defined by the Bush administration. We speak also of the ‘Criminal Underworld’. So the global ‘Underworld’ raised its head again, and the spectre of Al Qaeda, Osama Bin Laden, and International Terrorism was paraded before the eyes of the Western world. 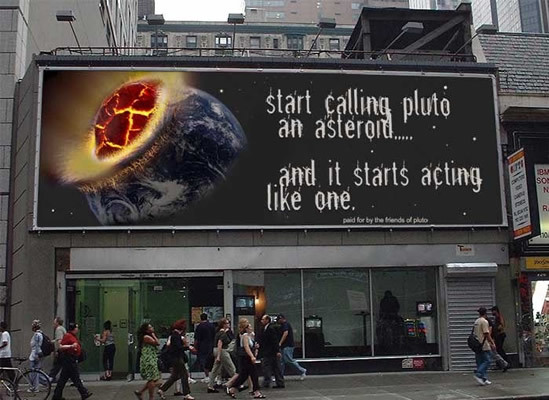 Hardly surprising then, that as a knee-jerk reaction, the ‘powers-that-be’ in the world of scientific astronomy would seek symbolically to rid the world of the scourge of the ‘Lord of the Underworld’, as they demoted the planet Pluto to the status of dwarf planet. What a delicious piece of astrological theatre! So what are we left with now? Essentially, a solar system that consists of the Sun and Moon, plus the usual visible planets, plus Uranus and Neptune. There has been created a category called ‘dwarf planets’ into which Pluto + Charon(5) have been placed, along with Ceres and UB313. Pluto is still considered as the largest object in the Kuiper Belt,(6) and thus our symbolism holds up well. Ceres was discovered in 1801, and although initially classed as a planet, this was changed as thousands more asteroids were discovered. Ceres, the Roman goddess of grain (cereal/Ceres) and fertility, is the same Earth-mother figure as Demeter, mother of Persephone, abducted by Hades (Pluto) for a sojourn in the Underworld. Thus she sustains an intimate connection with the Lord of the Underworld, and moreover, the sequence of events around her discovery repeated …….like the scythe which is her symbol, she was herself cut down. Ceres has a profound connection with the UK, because her discovery occurred within hours of the 1801 proclamation of the unity of England, Scotland, Wales and Ireland. These islands are blessed with many crop circles, mostly in fields of cereal. There is the Ceres connection again, in the exquisite symbol language of geometric forms appearing on the land. I think of them as the ‘Voice of Ceres’ for whoever can hear. 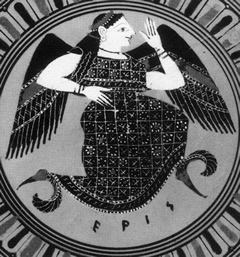 The ‘scattered disk object’ UB313 was named Eris on 13.9.2006 after the Greek goddess of Strife and Discord. Her orbit length is 560 years (Pluto’s is 240 years) and her trajectory is inclined a massive 44 degrees to the ecliptic. The mythic figure of Eris stirs up jealousy and envy and her story is thus reminiscent of the ‘13th fairy’. When excluded from a wedding, Eris spitefully provoked the quarrels and strife that led to the Trojan War. She serves as a reminder that what we exclude from our lives and hearts may return to 'give us trouble'! Eris has a moon, named Dysnomia, or the spirit of Lawlessness. Apparently, there was a choice as to whether to call this moon Dysnomia or Eunomia (= 'she who promotes harmony'). The IAU decided on the former. This naming is not prophecy, but metalogue, the celestial reflection of what is already occurring on our beleagured home planet Earth. The simple reflection of ‘What Is’ can be profoundly healing , and this is the function which I believe is served by this dramatic naming. Dare we hope that including Eris this time might herald the ending of the current ‘Trojan War’ in which we seem ever-deeper embroiled ? Interestingly, in the work of the ancient Greek philosopher Hesiod, Eris also symbolises the inner strife that it can sometimes require in order to align oneself with what is noble, good and worthwhile. This notion is perhaps what lies at the heart of what is meant by a ‘Crusade’ in Christianity, or a ‘Jihad’ in Islam - the inner struggle with one's own difficulties, 'demons' and disappointments. In zodiac terms, Eris is currently located in the sign of Aries, bringing into the centre of our awareness the fact that the real ‘battle’ is not 'out there' with others, but with our own lack of true will. And what about the astrology? Astrology began with naked eye observation of the planets (Gk. ‘wanderers’) crossing the night sky, and the visible planets still form the core of what astrologers use in their work. Beyond these ‘Classical’ planets, there are the ‘invisible’ planets Uranus and Neptune and Pluto, used by most astrologers. Beyond that, one works with ‘what is burnished into the soul’. (7) Meaning that the issue of classification has less significance than our inner relationship with the celestial phenomena we refer to and build our inner connection with. 'What' something is defined as may be less relevant than whether or not it 'speaks' to our imagination, heart, mind and soul. We have recently had a marvellous display of planetary symbolism working itself out even in the very process of ‘scientific’ classification! This is not the first time in history that the topography of the solar system has been revised, and we can be sure it will not be the last. The IAU decision still remains controversial, as the picture below demonstrates! (2) See www.nickyarris.com for his story. (3) See http://en.wikipedia.org/wiki/Scattered_disc for full description of this category. (5) Pluto and Charon are actually a binary system. Note that the positions of Pluto in the Ephemeris actually represent the ‘mean average’ of the orbital distance of the pair. i.e. the void, gap or hole in-between them. This fits the symbolism perfectly. (7) Richard Tarnas, at the Astrological Association Conference in Canterbury in 1994. *** The source of both photos is unknown to me. It is not my intention to use others' work without due credit, so please contact me with any copyright issues arising.